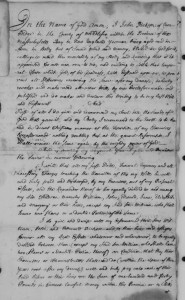 It has taken me a while to find a short and simple enough example of a will to use for this basic introduction to probate records. 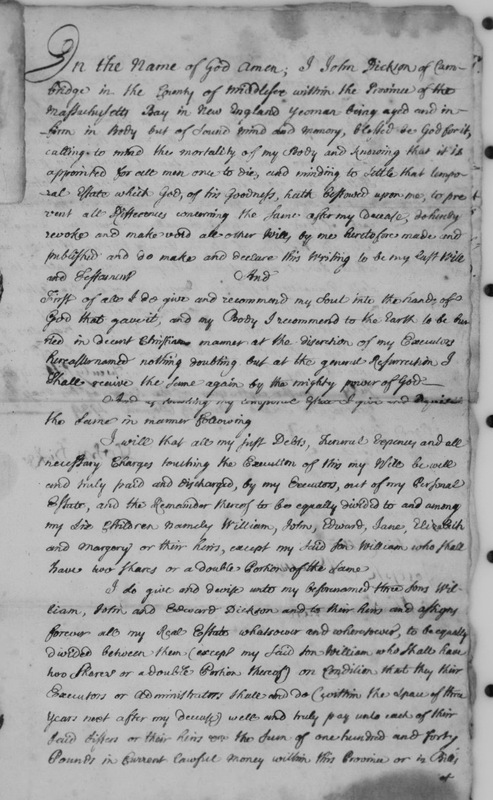 The will of John Dickson of Cambridge, yeoman, illustrated here, meets the short qualification although it has an interesting complication. 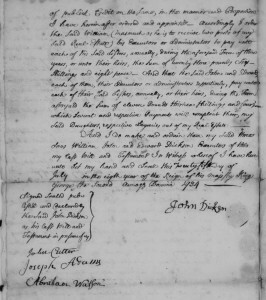 The full probate file can be seen on AmericanAncestors.org under Middlesex County, MA, Probate File Papers, 1648-1871, Case #6264, John Dixson-Dickson-Dikson. There are 28 papers in the file. Testate Estate: Where someone has written or dictated a will describing exactly how he or she wishes to leave his or her property and to whom. For the most part, a testator could leave anything to anyone, unless they were dealing with colonies such as Virginia that followed the laws of primogeniture where all real estate was left to the oldest son. This did not apply in New England, although it was customary to follow the legal model of giving a double share to the oldest son. A legitimate heir who was left out of a will could potentially contest it in court, thus the bequests of one pound or one dollar to cover any claim that someone had been accidentally forgotten. 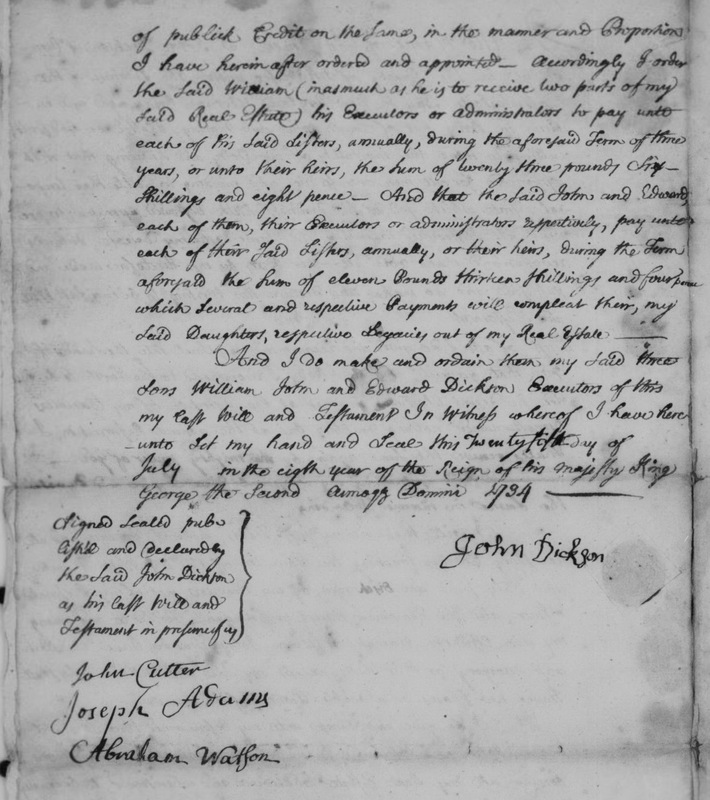 The testator in this case is John2 Dickson/Dixon, son of William1 and Jane/Jean (––) Dickson of Cambridge. John was born in 1656 and died in his eighty-second year in 1737. His wife was Margery/Margaret Winship, who predeceased him by three years. They had six children: Jane, who married (1) Joseph Robbins and (2) John Green; Elizabeth, who married (1) Hubbard Russell and (2) Joseph Holden; William, who married Ruth Prentice; John, who married Mary Russell; Margery, who married Samuel Carter; and Edward, who married Martha Dunster. Homework: Okay, I know you’re going to look anyway, so read through the probate record to find out the complication and meet me back here next week. Lucius R. Paige, History of Cambridge, Mass. 1630 to 1877 (Boston, 1877), p. 535. Thanks Alicia. I appreciate the example of my own ancestors! Chris, you’re a cousin to my client. She descends through the Samuel Carter marriage. I always wonder if when the person died there was enough money (real estate, etc.) to even cover the debts, and all the other bequests too! Mary, that indeed was often a problem. If there was not enough estate left, the court would have to determine how it would be divided. Somehow that comes as no surprise:) Thank You for the reply. Too bad though that the Court (State) has to get involved. Funds do simply dry up regardless what a Will says. Probate records are some of the most interesting reading there is. As long as you’re not involved, anyway (been there, not a lot of fun). Corrections: The File Number is #6263, rather than #6264, but the link is to the correct file. My count on the number of pages in the file is off — clearly, I was multi-tasking at the time, somebody’s file has 28 pages — #6263 has only 12 images in case you were counting. Also thanks to Westrack for lesson on Virginia probate laws — Virginia did not adhere to the Primogeniture rule exclusively. You are clearly an expert. 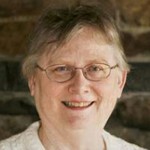 I am trying to get into the Society of the Cincinnati. I have two collateral ancestors in the Continental Army, Captain Abraham Hunt born in Braintree, MA on 2 June 1748 and Lt. Oliver Hunt born in Milton, MA on 18 January 1755 who are currently unrepresented in the Society according to their Research Librarian. Any chance you could be a resource for me as I apply? Hi Doug, Wish I could be helpful to you, but desk is overloaded. Good luck.